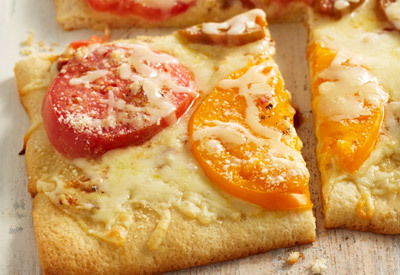 For added color, prepare pizza using 3 different colors of tomatoes. Top with 1 cup mozzarella and tomatoes. Mix dressing and garlic; drizzle over tomatoes. Sprinkle with remaining cheeses. Bake 8 minutes or until mozzarella is melted and crust is golden brown. Serve with a crisp mixed green salad and fresh fruit. Top pizza with 1/4 cup thinly sliced fresh basil leaves just before serving. Prepare as directed, substituting a 14- inch pizza pan for the baking sheet. Pat pizza dough into 14- inch circle, then top and bake as directed.